Everything you wanted to know about the AQHA breed and more..A must have for all Quarter Horse lovers. What a superb breed and read. 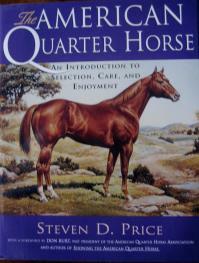 Steven Price brings a thorough and well written introduction to the selection, care and enjoyment of the American Quarter Horse. The foreword by Don Burt, past President of the AQHA, and the text and advice that follows is comprehensive and educational.Whether you are barrel racing, or showjumping, the versatility of this breed is legendary and well heralded around the world. If you want to show or race, Steven explains where to go and how to do it. From questions on Potomac Horse Fever to what jacket to wear in a competition, Steven has the answer. A thoroughly good introduction to the pleasures of the breed.